Choose from our wide selection of Plastic Playing Cards, including Kem, A-Plus, GEMACO, Copag, and many other premium brands. We offer both Narrow (2-1/4" x 3-1/2") and Wide Size (2-1/2" x 3-1/2") Cards. Many brands are available with regular or super index (large size) numbers and pips. 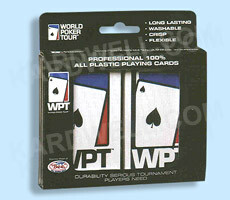 For additional information or wholesale pricing on Plastic Playing Cards, please contact us at 1-800-233-0828.